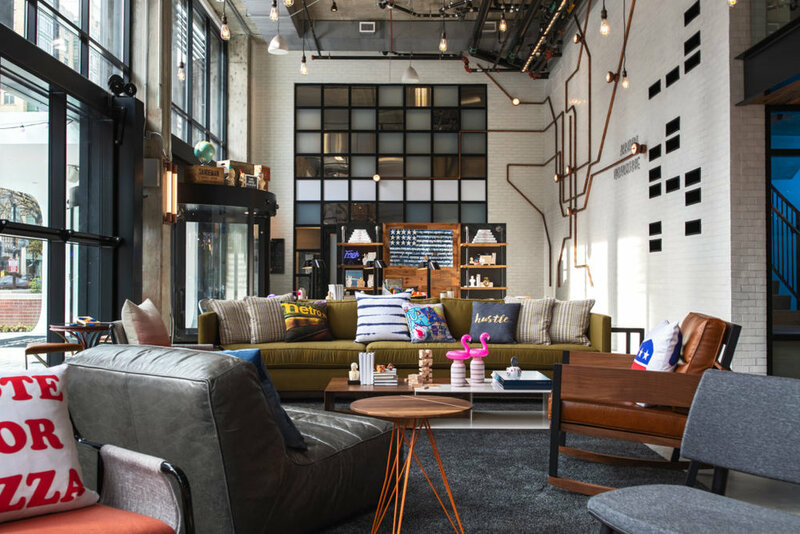 Nestled in the heart of downtown Washington, D.C. is the Moxy Hotel, with its hot pink neon sign front and center. Upon entering you’re met with fun and modern décor, like amazing art murals dedicated to our nation’s capital, games galore, novelty signs, Monopoly money on the wall and Trigger, the white carousel horse. The check-in desk is attached to the bar where you’ll receive a welcome cocktail, which is perfect for us here at WDFT. My stay at the Moxy included some fun activities that will most likely be available at different points in the year. A cocktail class with local woman-owned distillery, Republic Restoratives, set our evening off with Civic vodka and Rodham rye as our bases. I felt like a real bartender, ready to serve the masses the ‘Diamondback’ and the ‘Layover’ that I learned to make like the pros. I appreciated that the Moxy is collaborating with local businesses. Not only does it introduce newcomers to their goods, but it also reminds residents to visit and enjoy what’s nearby. Later in the night, we were given the chance to get read. You read that right. The Moxy invited a lipstick reader, who appeared on Dr. Oz, and a tarot card reader to give guests a rundown on who they are and what’s going on in their lives. It’s one of the more unique offerings I’ve ever seen in a hotel lobby, and left a guest or two shaken, but it was super fun and insightful. In true Moxy fashion, we played games the rest of the night, and I took my turn on Trigger the Horse, who I’m sure we’ll be seeing more of on social media, as more folks become hip to the hotel’s location. Apparently, a certain reality show celeb (*cough* HazelE *cough*) took advantage of the horse in more ways than one. The next morning, I woke up to a mimosa at my door...at 8 a.m. I’m not sure I’ve ever had a drink that early in the morning, but it’s apparent that the folks at the Moxy want you to live your best life. 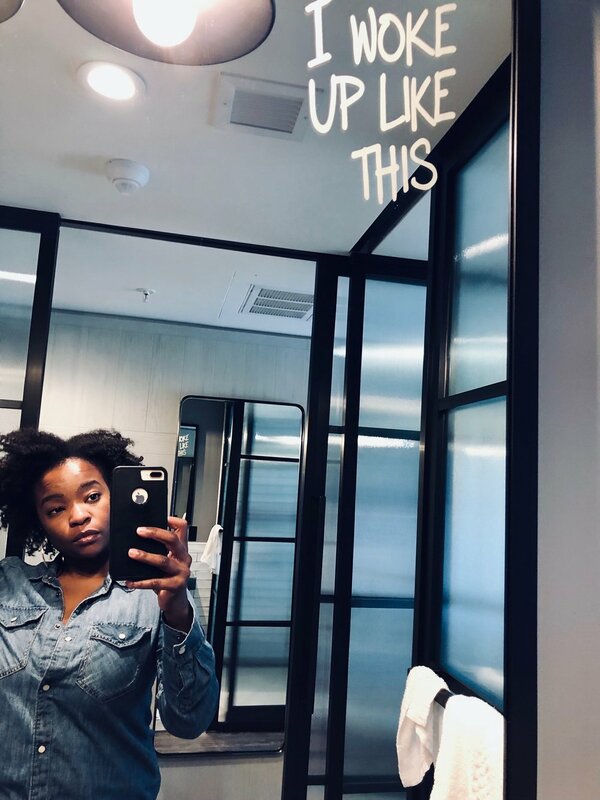 The rooms also inspire you to never want to leave, with a modern vintage vibe and expansive view of downtown D.C. My favorite part was the bathroom mirror that reminded me ‘I woke up like this,’ which was fabulous of course. After our morning cocktail, we were also treated to a yoga class on the rooftop, overlooking D.C., the sun shining on our hungover faces. The retractable rooftop is going to make an amazing space for happy hours, work events, weddings, bar mitzvahs, you name it. There are only a handful of rooftops like this in D.C. so this summer at the Moxy is sure to be a busy one. Breakfast at the Moxy is also an event. The menu features an assortment of bagels, a yummy breakfast naan, artisan coffees, and breakfast cocktails like the ‘Cold Brew Old Fashioned.’ You’re also welcome to enjoy the “Grab & Go” food center 24/7 whenever you get peckish, which can eliminate being forced to order room service. The staff will also suggest eateries nearby, if you’re looking for a heartier meal. Our group dined at Sfoglina, a Fabio Trabocchi restaurant, specializing in pasta and Italian cuisine. All in all, if you’re looking for a comfortable, unique, and fun-filled stay, the Moxy is the place for you. The staff do a great job of making sure you’re enjoying every moment of your stay, even though the décor, games, and Trigger will be sure to remind you in case you forget. Even if you’re not looking to sleepover, you can still enjoy the games, and the bar, which features a daily happy hour from 4-7 pm and includes snacks like truffle fries, a 12” hot dog, and naan flatbreads. My favorite cocktail is the ‘Shiso Pretty,’ made up of Bulleit rye and yuzu syrup. So good! Moxy hotel is located at 1011 K St, NW, DC 20001. For more information on the hotel, click here! Check out more pics from my stay below.